There are two ways to add our GDPR tags to WordPress. WordPress uses themes (templates), which are frequently updated to remain secure. As such, we don't want to edit the main files in a WordPress theme to add our GDPR code, as changes may be overwritten by subsequent updates. We handle this by using 'child' themes. A WordPress child theme is a basically just a folder in which any file that is found matching the name of a theme file, will be used instead of the original. In this folder you should see a folder matching your current theme. The default themes are twentyfifteen, twentysixteen.. etc. so if there is one in there that doesn't follow that pattern - then it's probably that one. 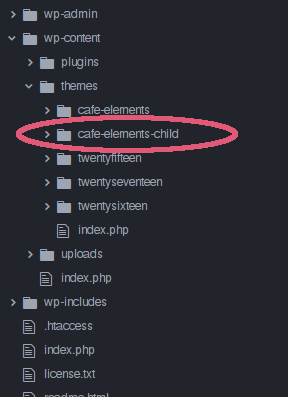 We want to see two theme folders; my-theme (substitute your actual theme name here - in this instance it's cafe-elements) and my-theme-child. If my-theme-child is already there, good - if not then create an empty folder with this name (your theme folder name with '-child' added on). Open the main my-theme folder and find header.php - copy this file, then go back to your child folder and paste it in there. Now you're ready to install your GDPR Compliance Kit or EU Visitor Blocker tag on your WordPress website. Ths is only 'best practice,' so if you get stuck with any of this, it's not the end of the world; you can still install our code using the steps below. We're going to need this shortly, so keep it handy. In your naivgation, go to Appearance > Editor. From the top right menu, select your child theme, containing your copied header.php file and click select. This will open your header file, which is where we'll insert our GDPR compliance or EU traffic blocking code. Now, just save your changes. Note: if you don't see a save button, you might need to make your file editable by changing the permissions. This can usually be done by right clicking the file and looking for a "Permissions" area - which may be inside the properties menu, or security. This is the file we located or created in the 'before you start' section. If your website is already online, you'll need to upload the new/edited file (and the child folder if you just created it) onto your website. You can do this via FTP, cPanel, or via your hosting company - just do it the same way you normally upload your files.